HanseMUN goes ScotMUN 2018 | HanseMUN e.V. Between the 2nd and 4th of March 2018 our MUN society send a delegation of 7 to the ScotMUN in Edinburgh. The conference can best be described with one word: snowy. At the time of the conference a snowstorm was taking place in Edinburgh shutting down the airport, public transport and even museums. Somehow all 6 delegates of our delegation still managed to arrive in Scotland, which made us one of the few delegations attending with the number of delegates expected. 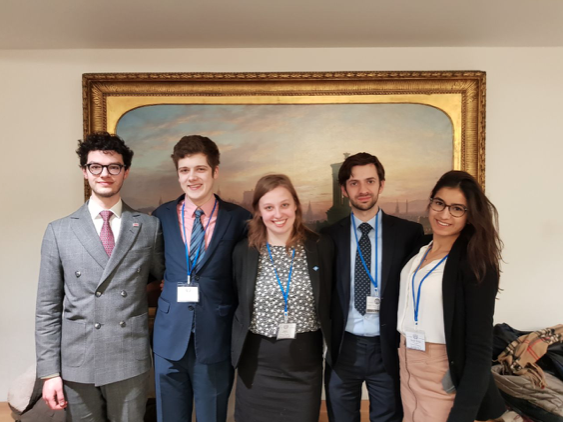 The conference itself therefore also became smaller which resulted in committees being merged, delegates being reallocated and constant changes of plans which the ScotMUN organisation team handled incredibly well. All in all the ScotMUN still became an amazing experience and a great conference for our delegation. 5 of us were participating as delegates in a wide spectrum of committees ranging from Security Council to G77 to SOCHUM. One of us took part as a chair and had to spontaneously chair the UNFCCC additionally to the UNDP. All of us have contributed to the debates in our committees, made new friends and experienced the amazing socials and the beauty of Scotland. Therefore even though ScotMUN might not have went exactly as planned it is still an amazing experience and the snow provided us with more funny stories than we could have ever wished for.